How to Choose the Right Tile for Your Pool – Mees Distributors, Inc.
Have you stopped dreaming about building a pool in your backyard this summer and already met with your contractors to start construction? If you have, you know there are many questions you need to answer. 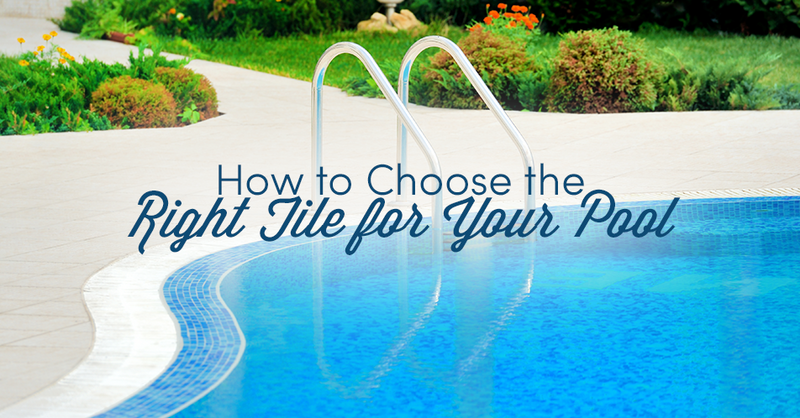 Most homeowners spend the most time considering questions concerning the size and shape of their future pool, but tend to forget about an issue which is even more important: What type of pool tile is best? The choice of tile is important because it will continue to affect your enjoyment and future use of your pool for years to come. Before you choose the right tile, you need to know which type gives you the right balance of appearance, durability and ease of maintenance. There are three types of tiles installed in a pool: glass, ceramic (porcelain) and stone tiles. Each type has its own advantages and disadvantages. Glass tiles offer pool owners a luxurious appearance, but all that beauty can come with a hefty price tag. It is possible to custom mold glass tiles to attach flush onto any pool shape. Many glass tiles are iridescent and shimmer when lit with underwater lights. Glass tiles come in many shapes and sizes, and it is possible to create breath-taking mosaics which turn your pool into a work of art. Ceramic and porcelain tiles are very similar and share the same benefits. These types of tiles are the ones you probably see in larger commercial pools in your community. Ceramic and porcelain tiles are strong, inexpensive and come in an incredible array of colors and sizes. Many pool owners select a variety of shapes and colors of tiles to create focal points in their pools. These types of tiles are remarkably durable, easy to clean and, with proper maintenance, can last for decades. Stone tiles are a more earthy choice than glass, porcelain or ceramic tiles. Many homeowners love the way stone feels under their feet and appreciate the look of stone’s natural variations. They are great at retaining heat and provide a non-slip walkway. There are stones to match any décor or blend seamlessly into any architectural style. While stone tiles can be cheaper than glass tiles, particular stone tiles, like granite, can cost much more. Do you want to learn more about which tiles are right for your pool, sauna or hot tub project? Contact us today at Mees Distributors, Inc. to learn more about our available tile options, or visit one of our showrooms to check out our large inventory of tiles and natural stones including marble, granite and more.